Being a Hjärtekviltare you share your knowledge, time and interest. There is nothing more valuable than a helping hand when you are stuck because the pattern is a complicated pattern or you want to learn a new skill. Nothing is more inspiring than to see what fellow quilters have accomplished. Who and what are the Hjärtekviltarna ? Well, we are a number of women with a mutual interest in textiles and particularly patchwork and quilting. We decided on the name when planning our first show at Åbergs trädgård (Åbergs Garden) 2006. The first quilt group in Ystad was the “Lapptoserna” which held its first meeting in 1992 and still meets once a month. The group organized a small quilt show at the local library in Ystad and those interested in joining could leave their name. In 1995 this resulted in a new group calling itself Patchgirls (which actually is Lapptöser in English). These groups led to bigger and better things. A group of “ladies interested in quilting” wanted to engage a teacher for a class but to finance this, we needed to form a larger organization. We first borrowed a place at a local football (soccer) club. As word passed, more people wanted to join. For a number of years we rented space in an inn just outside Ystad when classes were held. In February, 2006, several quilters from different groups met at Stora Herrestad and decided to join under one name and also attempt to set up a show. We decided that Heart Quilters would be a suitable name. One of the members worked at a local plant nursery (www.abergsgarden.nu). A cafe’ was under construction at the nursery, opening in the summer. What if we could have a show there? The Aberg family was very supportive of this idea so we began making plans for a show in July, coinciding with the opening of the café’. The outdoor quilt show was very successful, attracting many visitors. At this first show 20 ladies exhibited their work. In 2009, there were 26 exhibitors and at the 2012 show we had 32 participants. The 2006 show attracted such interest that many more quilters wanted to join us. Most of them were from Ystad. We borrowed room at a sports ground and also from a senior club. Finally we obtained room at the Studieforbundet vuxenskolan (SV). We have followed SV to various locations and are now housed with them at Spanienfarargatan at the Bornholmferries terminal in Ystad. Here we even have a small room where sewing machines and other equipment can be stored. Meeting here Tuesdays and Thursdays, we talk, sew, plan, sew, drink coffee, exchange ideas and talk a bit more. The Heart Quilters is a loosely connected group of ladies interested in quilting. Men are also welcome, but no one has – as yet – said he is interested. We are a group of friends under SV and we are not the only quilt group around. Some of us are members of more than one group while others are members of just the Heart Quilters. We share members with a quilt group in Kivik, which meets weekly. In Simrishamn there is Osterlens kviltgille – a local group under Rikstacket (www.rikstacket.se). A small group in Skurup has now joined the Heart Quilters. This summer (2013) a new group has formed – the Ystadquiltarna. If you are interested in quilting and patchwork you are welcome to join in with us at meetings, shows, classes, outings, and other events. 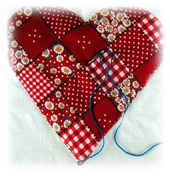 Being a Heart Quilter you share your knowledge, time and interest. Many a friendship has developed here. In addition to producing our own work, the Heart Quilters have participated in some community projects. Ystad Kopmannaforening (an association of local merchants) arranged to collect men’s ties to raise funds for the Swedish Cancer Society and gave the ties to us. Making them into new items was a real challenge but we succeeded. We joined forces with Kopmannaforeningen and also collected men’s shirts – another challenging but successful project. The resulting products of this recycling effort have been sold and the money raised – as well as the items not sold – have been given to the project Livslust I Ystad (www.livslustystad.se), a non-profit association that assists patients with cancer, cancer survivors and those around them. We have also sewn Pyttetacken (tiny quilts) for the Neonatal ward in Lund. with the help of Peggy and Bob (thank you for helping out).